It’s not jobs or clear air. We can have both. 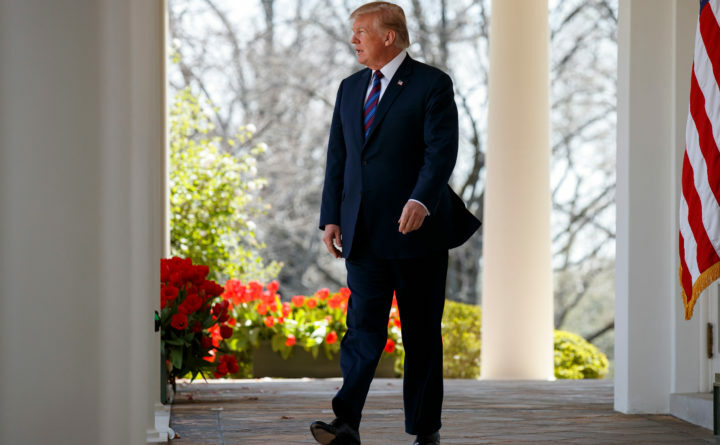 President Donald Trump arrives to speak during an event on tax policy in the Rose Garden of the White House in Washington, April 12, 2018. Trump is ordering the Environmental Protection Agency to move faster on processing air pollution permits for businesses. A White House memorandum issued on April 12, instructs the EPA to take final action on Clean Air Act permit applications within one year. The Trump administration is working on many fronts to rollback air pollution standards and other environmental regulations. As usual, the administration argues that rigorous regulations are harmful to business and that easing such standards will lead to job creation and a more prosperous economy. What the president and other officials fail to mention is that strict air pollution standards exist to protect our health. If companies were allowed to spew pollution and dump toxins without little oversight, more Americans will suffer and die. That is not hyperbole. That is reality. Maine’s adult asthma rate is significantly higher than the national average, with more than 131,000 Maine adults diagnosed with asthma. Air pollution can worsen asthma symptoms as well as other respiratory ailments such chronic-obstructive pulmonary disorder and lung cancer. A recent study by researchers at the Massachusetts Institute of Technology found that air pollution leads to 200,000 premature deaths annually in the United States. Vehicle emissions are the top source of this pollution, followed by power plants and industrial sources. The Trump administration is working to ease regulations on all three to promote job growth. The Environmental Protection Agency, as its name suggests, is charged with protecting our environment. It must fulfill that mission. Other agencies are tasked with economic development. The EPA was created in 1970, by Republican President Richard Nixon, “as a result of heightened public concerns about deteriorating city air, natural areas littered with debris, and urban water supplies contaminated with dangerous impurities,” the agency’s website says. Nixon also presented Congress with a 37-point plan about the environment, which included actions such as national air quality standards, a proposed tax on lead additives to gasoline, a ban on dumping in the Great Lakes and funding for research. Nearly 50 years later, President Donald Trump is gutting many of these protections by appointing former Oklahoma Attorney General Scott Pruitt, who frequently sued the EPA, to oversee the agency. The president is also going around the EPA by issuing directives that make regulations more lenient. One of the latest directs the EPA to ease air quality standards for cities that are not currently meeting standards. This is necessary, the directive says, to promote domestic manufacturing and job creation. This idea that economic growth and environmental regulations are incompatible is wrong, and dangerous. Maine and eight other northeastern states, for example, created the Regional Greenhouse Gas Initiative to reduce carbon dioxide emissions from power plants in the region. The initiative has cut emissions in half in nine years, a recent analysis found. At the same time, the region’s economy has added 14,500 jobs over the last three years and utility customers have saved more than $200 million as energy bills have shrunk. The American public understands the importance of environmental regulations, even if the Trump administration does not. In a recent Politico poll, 54 percent of voters said the federal government “should do more to strengthen environmental protections, even if it hurts some businesses.” Only 23 percent said the federal government should “do more to help U.S. businesses, even if it weakens environmental protections.” The numbers were similar for voters who identified the economy as their top priority. Putting business interests ahead of the people’s health and the environment may make a great soundbite for Trump’s supporters, but it is bad policy that will harm America in the long run.